This post has been sponsored by The Home Depot via Glam Media. All thoughts and opinions are my own. Despite the fact that my kitchen is in sore need of an update, it is still my favorite room of the house. So many happy moments occur in the kitchen…and it’s in the kitchen that the entire family is together more often than in any other room. When we first bought our small house over 15 years ago, the kitchen was the selling point. Unlike most townhouse kitchens, ours was wide open with a large breakfast bar dividing the cabinets and sink from the dining area. That breakfast bar has been the most useful and utilized part of our kitchen – food is prepared, mixed, chopped, arranged and finally served there. 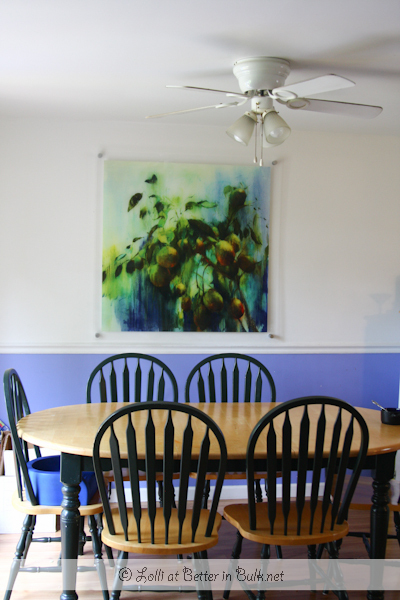 My kitchen – I love my periwinkle walls and matching artwork that is easily wiped clean… handy in a house with 5 kids! Our almost-40-year-old kitchen is holding up well, but even the updates that we’ve made over the last 15 years, paired with those things that we haven’t been able to update, have left our kitchen in need of some Tender Loving Care. It’s long past time to revitalize a few aspects of this part of the house, but without a ton of money to spend on big changes, we’ve had to rely on a few frugal tips to keep our kitchen looking good. My dream kitchen. Someday. Someday! A fresh coat of paint on the walls does wonders for any room, including the kitchen. When we changed the kitchen from drab earthy tones to periwinkle blue and a soft yellow, my mood was immediately effected. The blue and yellow make me happy! Don’t forget that you can also repaint your cabinets for a totally new look (we painted our cabinets a pale yellow!). Add some art to the walls. Show your personality! You don’t have to do anything expensive or permanent to give your kitchen a little lift. Accessorize! Think of the knobs and handles and other hardware as your kitchen’s jewelry. Dress it up a bit with some new cabinet hardware – you may be shocked to see the difference that a few new handles will make on the look and feel of your cabinets. Organize! Hide the clutter on the countertops with cabinet and drawer organizers. I know I always feel like I’ve got a new room full of new supplies when I simply take the time to get the right tools to keep things organized. Resurface the cabinets – if there is one thing I would love to spend a little bit of money on, it’s refacing the cabinets. The shelves and structure of the cabinets are in decent shape, so getting new cabinet doors would make it appear is if we spent big bucks on a completely new kitchen. A kitchen makeover doesn’t have to be a huge ordeal. Look at the difference a few changes made in this kitchen! Despite the fact that I stick by my frugal tips to revitalize your kitchen, I admit that I enjoy day dreaming and “window shopping” for amazing kitchen designs and ideas (both for future kitchens in bigger houses and for ideas that I can implement right here, right now). The Home Depot is a great resource for kitchen cabinetry upgrades as well as paint, organizing products, new appliances, accessories and more. I love their Reface, Replace, and Re-new options for a ton of gorgeous kitchen cabinetry ideas and inspiration. Be sure to check out my group Pinterest board, Revitalize & Redesign, where fellow bloggers and I have pinned some of our favorite kitchen remodel and revitalize ideas, including before and after pictures, accessories, and organization tools. I promise you’ll leave Pinterest feeling inspired. What is the first thing YOU would change about your kitchen if you could? Replace, Reface, ReNew are three options available ONLY at The Home Depot. Replace allows for full transformation of your kitchen cabinets with an array of choices from top brands. Reface is a perfect option to update your cabinets without a major renovation. And lastly, ReNew is ideal for consumers who want to give their existing cabinets a facelift without major disruptions and cost. And to complete your kitchen project, The Home Depot is your one stop shop for countertops, sinks, appliances, backsplashes and lighting. Disclosure: Compensation was provided by The Home Depot via Glam Media. The opinions expressed herein are those of the author and are not indicative of the opinions or positions of The Home Depot. The kitchen is where most time step during the day I always want to keep it clean and tidy, very good tips that help me organize and keep clean! These are great ideas but I rent so I can’t really paint or change the hardware on the cabinets. I will keep this in mind for when we buy a house soon. I also want some inspiration for my kitchen as the wall colour is perfect but I don’t like my cabinet’s colour. It is so boring and dull. Lolli, thanks a lot for providing these fabulous tips. I am glad to have your tips with me. Now I have decided to paint my cabinets with pale yellow colour. Home Depot is the best! We’ve been waiting for the weather to cool off, but we want to paint next month when we can leave the windows open. We plan to go to Home Depot because they have good brands and the people that work there are so awesome! What a great post and tips… I would love to change my ceiling fan… it is so dated… and does not fit the look of my kitchen! We changed all of our ceiling fans a few years ago. It makes a bigger difference than you might think! Very helpful info, now if I only had the house! Haha! I can empathize, Mitch! I have a teeny townhouse (with 7 of us in it. It’s crazy most of the time) and can’t do most of what I wish I could do to it. I’m just hoping that someday I’ll have some extra space…for elbow room and creativity! I love Home Depot and use them all the time to decorate! Love the design on the back rest of those chairs.